"If you can dream it, you can do it" - Walt Disney. The emergence of cloud technology is providing a whole new outlook on the traditional law firm model. Mobility, lower IT costs, simplified IT processes and widespread acceptance of staff working from home, drives the minds of legal entrepreneurs wanting to start their own firm and be their own boss. LEAP has over 20 years of experience providing law firms with innovative software solutions to help them grow, make more money and provide a better service to their clients. We know how law firms work, what is important to them and how to provide a smooth as possible transition to move your firm into the 21st century. LEAP’s focus is on the needs of law firms, that is why more than 5,000 firms in Australia have already transitioned to LEAP. Thanks to innovative new advances in technology, it has never been easier or cheaper to start your own law firm. 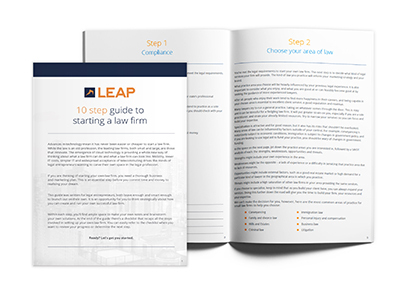 LEAP includes everything you need to manage the day to day requirements of a law firm so you can start making money, fast. Download your free comprehensive guide to get you started. Capture all your billable time with an intuitive timesheet.